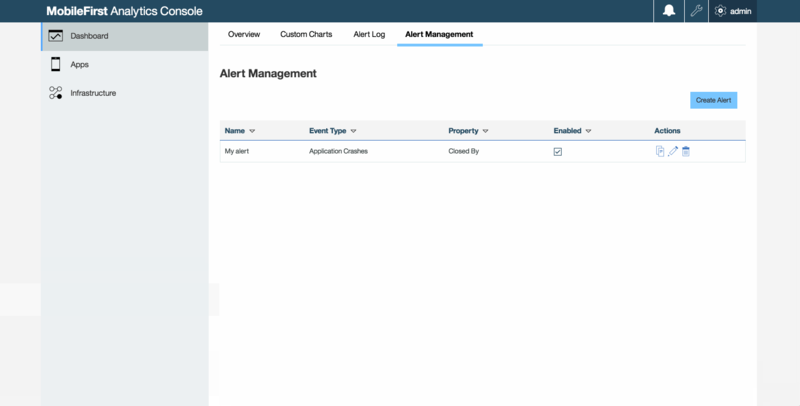 Alerts provide a proactive means to monitor the health of your mobile apps without having to check the IBM MobileFirst Analytics Console regularly. You can set reactive thresholds in the MobileFirst Analytics Console to trigger alerts when a specific criteria is met. You can set thresholds at a broad level (a specific app) or at a granular level (a specific app instance or device). Alert notifications can be configured to display in the Analytics Console, and also be sent to a pre-configured REST endpoint or custom webhook. Once alerts are triggered, the Alert icon (in the title bar of the Analytics Console) displays the alert count in red ( ). Click the Alert icon to view the alerts. Alternate methods are available for distributing the alerts. Prerequisite: Ensure that the MobileFirst Analytics Server is started and ready to receive client logs. Select the Dashboard→Alert Management tab. Click the Create Alert button. Provide the following values: Alert Name, Message, Query Frequency, and Event Type. Depending on the Event Type, populate the additional text boxes that appear with the appropriate values. Once all values are entered, click Next. The Distribution Method tab appears. By default, the alert is displayed in the Analytics Console. You can also send a POST message with a JSON payload to both the Analytics Console and to a customized URL by selecting the Analytics Console and Network Post option. You can set up a custom distribution method for an alert. For example: define a web hook to which a payload is sent to when an alert threshold is triggered. "message": "The crash count for a application ABC exceeded XYZ. to see a detailed stacktrace of this crash instance." timestamp - the time at which the alert notification was created. condition - the threshold that was set by the user (for example, greater than or equals 5). eventType - the eventType that was queried. property - the property of the eventType that was queried. value - the value of the property that was queried. offenders - a list of apps or devices that triggered the alert. title - the user-defined title. message - the user-defined message. 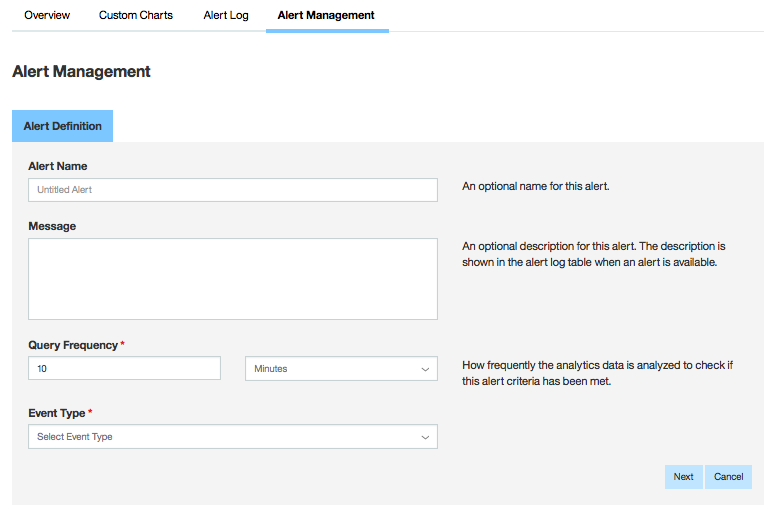 Alert details can be viewed from the Dashboard→Alert Log tab in the MobileFirst Analytics Console.